The Operations Department is comprised of seven divisions and nine battalions that include 72 fire stations. Most divisions are divided into two Battalions under the command of field Battalion Chiefs. 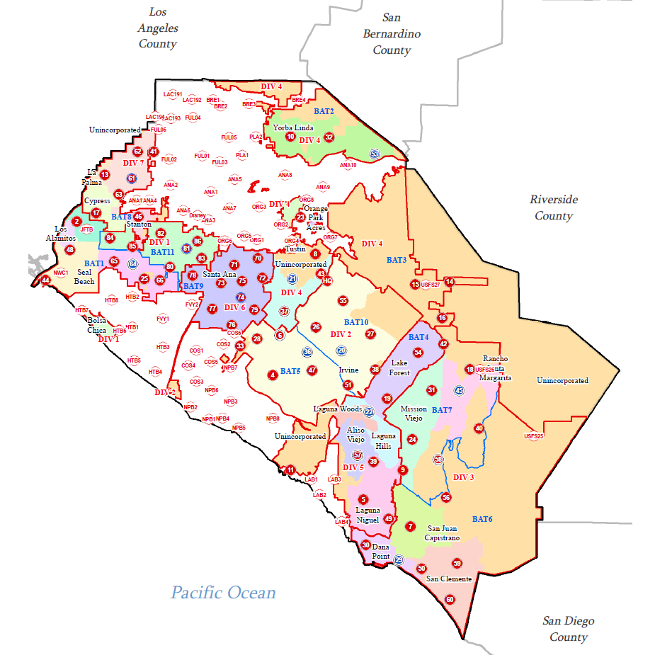 Within these Battalions are 72 fire stations (5-10 stations per Battalion) that provide regional emergency response to all fires, medical aids, rescues, hazardous materials incidents, widlland fire, aircraft fire and rescue services to John Wayne Airport, and other miscellaneous emergencies. The Emergency Medical Services Section manages the delivery of medical services by OCFA emergency medical technicians and paramedics. Essential to providing care is our continuing quality improvement program, guided by our physician medical director and implemented by our nurse educators; "C.Q.I." begins with providing education at both the emergency medical technician and paramedic levels for both career and reserve personnel. In addition to ongoing training, the EMS Section is a quality assurance resource through our ongoing review of patient care provided. The Section is also responsible for EMS supply and equipment evaluation and purchasing; monitoring and tracking of paramedic licensure and EMT-1 certifications; ambulance contract administration oversight, including management of the ALS and medical supply pass-through fees program. Additionally, the EMS Section serves as a liaison to County and State regulatory agencies, hospitals, ambulance providers and other EMS groups, such as the State Firescope EMS Committee. The Section is responsible for meeting paramedic staffing needs through recruitment, selection, support and evaluation, and accreditation of prospective paramedics. The Section participates in the review of local, state and national legislation, regulations, and policies that affect EMS. Members of the Section participate in EMS workgroups, committees and advisory boards at the County, State, and Federal levels. The Section is also responsible for our immunization and communicable disease prevention and surveillance program. The Wellness and Fitness (WEFIT) Program also reports to the EMS Section. The WEFIT Coordinator, who is a member of Operations, schedules wellness exams, coordinates the peer fitness trainers, provides employee health education and fitness programs, as well as the physical training of recruits in academies. The Critical Incident Stress Management Program is also a component of the Emergency Medical Services Section. This program provides, proactively, professional and peer level support to our members who have been exposed to incidents that have the potential to have short and long impact to one's mental well-being. The Operations Training & Safety Section is committed to promoting and supporting the safety and training of our Operations personnel by providing relevant, high-quality training. Chief Pardi currently heads up the Operations Training and Safety Section and is responsible for the overall management of its personnel and programs. The Orange County Fire Authority is the sponsoring agency for California Task Force 5 (CA TF-5). The California Urban Search and Rescue Task Force 5 is one of 28 National and one of eight California US&R Task Forces that respond as a FEMA or California OES resource during National or regional emergencies such as earthquakes, terrorist attacks, hurricanes or any other natural or manmade disaster that requires highly skilled search and rescue personnel. Although the US&R Task Forces are FEMA resources, the Task Forces work for and in support of local response agencies. Please visit the Task Force 5 website for further information. The EPAC Section has three primary areas of responsibilitiy: Emergency Management Planning, Agreement Coordination, and Homeland Security Grant Coordinations. The EPAC Chief is the OCFA's representative to the Operational Area Emergency Operations Center (Loma Ridge). There the EPAC Chief is the Operational Area Fire Mutual Aid Representative to the California Office of Emergency Services Region I office. The EPAC Chief is also the Operational Area Fire Resources Branch Coordinator. The EPAC Chief also coordinates and facilitates all the Operational Agreements that the OCFA maintains with outside entities including: auto-aid, mutual aid, Cal OES, Cal-Fire and US Forest Service Agreements. Finally, the EPAC Chief oversees the Captain assigned to the Orange County Intelligence and Assessment Center (OCIAC) and the all the grants tied to the Office of Homeland Security. These include the Urban Area Security Initiative (UASI) and the State Homeland Security Grant Program (SHSGP) and the programs funded by those programs. The Organizational Development & Training (ODT) section is responsible for overseeing performance improvement, organizational development, workforce/employee development, and succession planning efforts for the Orange County Fire Authority (OCFA). The Strategic Services Section provides strategic and advanced planning functions for OCFA. Included planning features are: California Environmental Quality Act review, Secured Fire Protection Agreement developer infill fee projects, deployment and resource modeling, analytics and statistical data review, new station placement and agreements, Strategic Plan, Standards of Cover, Accreditation, ISO, and LAFCO coordination. Monitoring land use, annexations, and associated new road and development pre-planning are also priorities of the section. The Investigations Section conducts accurate fire investigation and evaluation and initiates early intervention strategies. The Section also manages the administration of the Fire FRIENDS program administration, and provides continuous OCFIRS Quality Assurance and accurate State and National reporting.